The following article is from consumerenergycenter.org. Based in California, where weather and building practices differ here and there, the principles are the same everywhere. There was a dance in the 1960s called “The Tighten Up” by Archie Bell and the Drells that topped both the pop and R&B charts in 1968. But we’re talking about a different type of tightening up here. You can take steps to “tighten up” the insulation envelope of your house, improving a drafty, uncomfortable home that wastes energy. Sometimes the measures can be very inexpensive. The first step is an energy audit of your home. But keep in mind that closing the air leaks is necessary. A 1/16” unsealed crack around a window lets in as much cold air as leaving the window open 1/2”. The chart below shows the locations that cold air can leak into or warm air leak out of your home. Sometimes it pays to have an energy expert tell you how to make your home more energy efficient. During an energy audit, a professional inspector normally will visit your home to identify potential energy-saving measures. They’ll peer into your attic. Measure the depth of the insulation. Crawl under your house. Check seals around windows and doors. Check you appliances. Count your windows and check to see if they’re double-paned. They’ll usually prepare a written report explaining what needs to be done to your home to reduce your energy consumption. Many local electric and gas utilities offer energy audit services, or can refer you to private sources for this service. Either check out their website (ours is Dominion East Ohio’s GoodCents program at www.deoppwes.com) or call their customer phone number – both should be listed on your energy bill(s). Energy prices are on the rise across the nation. As a result, heating costs will consume an increasingly larger portion of a household’s energy budget. That’s why it’s important to check your home to insure that your heating dollars aren’t being wasted. By preventing leaks, you keep in valuable heat and make your home more comfortable while keeping those escalating bills at bay. Eventually, all homes need fresh caulking to fill gaps and cracks that may appear in walls and where different types of materials are joined. Checking and repairing caulk should be one of those maintenance projects that get done around the house every year or two. It not only saves on heating and air conditioning bills, it prevents moisture and even insects from entering your walls. Caulk is a pliable sealant that comes in large tubes that can be purchased at most hardware stores. Once the caulk is applied, it solidifies in the air to fill gaps, cracks and spaces at joints and connections all around your home. Some caulks don’t turn hard but remain pliable like a rubber. Look around the outside of your house for places that need to be filled in. If your heater is on, you may be able to feel drafts where heated air is escaping from cracks. In particular, look for gaps and holes around door and window frames, wall and roof vents, and skylights. Examine around outdoor faucets and where the gas pipes and electrical lines enter the house. Check the joints where siding joins at corners and where it meets the roof and the foundation, or where it meets the fireplace chimney. Before you begin, the surface you are caulking should be relatively clean. Old caulk should be stripped or scraped out of the gap or crack. It’s best not to wash or pressure wash the area because water may be forced through the crack and could cause some damage. Wipe down the surface with a damp cloth to remove any residue or dirt. Make sure it is clean and dry before beginning to caulk. There are caulks made specifically for concrete, for brick, for wood, and even for glass and metal. Caulking can be made of pure latex, siliconized latex, polyurethane and other modern materials. Choosing the proper one for your task from the array of choices can be a daunting task. Ask someone at the hardware store for advice. Important qualities to look for when choosing caulk are life expectancy, how much it shrinks over time, whether or not it can be painted, and if it cleans up with soap and water or needs a solvent like paint thinner. For most exterior uses around the house, you can use polyurethane caulk. It sticks to just about everything and doesn’t totally harden, but remains flexible. For that reason it tends to last longer, and it doesn’t shrink as much as some other types. Caulking guns use a racheted plunger to force the caulk out the tube when you pull a trigger. Some caulking guns are made of metal, while others are manufactured from fiberglass and nylon, or even ABS plastic. To load a caulking gun, pull back on the plunger, and then drop the new tube of caulk in the barrel, rear end first. Pull the trigger or push the plunger until it contacts the rear of the cartridge. Trim the nozzle of the caulk tube. It’s best to cut it on a 45-degree angle. Break the seal on the tube by inserting a nail or small screwdriver into the nozzle’s opening. Now, by squeezing the trigger, you can force caulk out the end of the nozzle while you move the tip of the nozzle along a seam. You can either push or pull the caulk into a seam, but pushing forces the caulk into narrow seams more effectively. By moving the gun slowly and evenly, you’ll get a clean professional job. To stop caulking at the end of a seam, simply push the nozzle into the corner to cut the strip of caulk. Twist the nozzle and lift away. You don’t need to smooth caulk after it’s applied, except for the sake of appearance. Latex caulk can be smoothed with a finger dipped in water. You can also use the back of a spoon to produce a smooth finish. Smoothing should be done soon after the caulk is applied, however – smoothing caulk as it dries sometimes causes it to crack. Most caulk works best on cracks that are less than half an inch wide. Wider cracks can be sometimes bridged by two strips of caulk applied side by side. Try filling deep cracks with wadded-up fiberglass insulation or some other backing material. Always pry out any old caulk before you install new caulk, and be sure the surface on which you’re working is clean and dry. You may have already caulked and weather stripped the envelope of your house to the point that it’s airtight, and you may still be wasting energy. That’s why it’s important to examine your home’s ductwork when you plan for energy efficiency. Old duct tape – the worse thing to use to seal ductwork, by the way – will dry up and fall off over time, allowing junctions and splices to open, spilling heated air into your attic or under the house. It’s wasteful. According to field research performed by the California Energy Commission, you can save roughly 10% of your heating bill by preventing leaky ducts. Leaky ducts waste heated and cooled air even before it arrives inside your carefully weather stripped building envelope. There are plenty of duct horror stories. One of the bathrooms in California Energy Commission staffer Claudia Chandler’s Northern California home, for example, had no heating vent. “The room was always uncomfortable – too hot in the summer, too cold in the winter,” she complained. So she hired an air conditioning company to install a heater outlet in the bathroom. When the technician crawled under the house, he discovered ductwork was already in place leading to the bathroom. It snaked across the ground, open and unconnected at the far end. When the open duct was attached to a properly working vent, Chandler’s bathroom was finally comfortable. Better yet, her summer electricity bill dropped by $15 a month. Another Energy Commission staffer had a central furnace and air conditioner replaced. The ducts under the house were checked, and duct tape supposedly sealing and holding two duct sections together had dried up and failed. The two sections had fallen apart, and that hole was also heating and cooling the crawl space under that person’s house. It was fixed properly with sheet metal screws holding the sections together and mastic covering the entire seal. The graphic below shows common areas where there are problems with the ducts and vents. Each autumn before cold weather begins it’s always a good idea to get a routine maintenance and inspection of your heating system to make sure it’s in good working order. At the same time, have the air conditioning contractor make at least a visual inspection of your duct system. If you’ve noticed any problems – rooms that don’t get warm, even though the rest of the house is fine, for example – make sure the inspector knows about it, so he can look for a problem. Depending on how accessible your attic or crawl space is, you may be able to inspect your ductwork yourself. Check for loose connections and joints that have come apart. Look for rips or tears, or for crushed ducts. It’s also a good idea to clean and inspect your vents where they enter the room. Sacrament resident and novelist Patti Berg did so after she and her husband moved into a new apartment. Very little heated air came through the register in their bedroom, leaving the room too cold in the winter. When she removed the grill, she discovered that a previous renter had blocked off most of the duct with cardboard. “I guess it was the other tenant’s way of trying to adjust a duct system that wasn’t very well designed, but it made for an unpleasant house,” said Berg. Closing off a vent in that fashion could be harming your heating and air conditioning system. Please see our page on Energy Myths about Vents. Simply put, the point is this: today’s homes are better insulated, with improved weather stripping to keep heat inside during the winter. Windows have become increasingly more sophisticated, with high-tech coatings and gases between multiple panes of glass that improve their insulating value. As a result, energy savings can be startling – providing you duct system isn’t squandering the benefits. Properly insulated homes can use 30-50% less energy than homes without insulation. 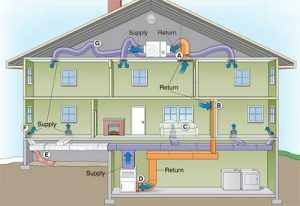 Lining your “thermal envelope” – adding materials that don’t readily allow heat to leak through your wall, ceilings, floors, from around your home’s foundations and its ductwork – saves energy by keeping heat in during the winter and keeping heat out during the summer. The effectiveness of a piece of insulation is measured by its R-value. The R-value in insulation designates its resistance to heat flow. The higher the R-value, the greater the insulating ability – the more effective it is. Generally speaking, each time you double the R-value of insulation, you cut your conduction heat loss in that area in half. You can greatly increase the energy efficiency and comfort of a home by installing insulation with an R-value higher than the minimum requirements. But to truly enjoy the benefits of insulation, it must be installed correctly. Compressing it or leaving gaps through which are can flow can cut insulation’s effectiveness in half. When insulating your attic, it’s important not to clog the attic vents under the eaves. Keep air circulating freely above the insulation by installing baffles (typically a piece of fiberglass batt placed several inches away from the vent. For fire safety, keep insulation clear of heat producing devices such as doorbell transformers and recessed lights, flues or vents from furnaces, water heaters, fireplaces, and exhaust fans. In unfinished attic spaces, insulate between and over the floor joists to seal off living spaces below*, and attic access door. In finished attic rooms with or without dormers, insulate between the studs of “knee” walls, between the studs and rafters of exterior walls and roof; ceilings with cold spaces above. All exterior walls, including walls between living spaces and unheated garages, shed roofs, or storage areas; foundation walls above ground level; foundation walls in heated basements, the full wall either interior or exterior. Floors above cold spaces, such as vented crawl spaces and unheated garages. Also insulate any portion of the floor in a room that is cantilevered beyond the exterior wall below; slab floors built directly on the ground**; or as an alternative to floor insulation, foundation walls of unvented crawl spaces; extend insulation into joist space to reduce air flows. Replacement or storm windows and caulk around all windows and doors. **For new construction, slab on grade insulation should be installed to extent required by building codes, or greater. Fiberglass insulation available as blanket-like batts is the industry standard. It’s actually glass, spun into long fibers, then woven and coated with a binding agent. Now available with 30% or more post-consumer recycled glass, fiberglass also comes as loose-fill and as rigid boards. Fiberglass batt insulation is popular because it’s relatively easy to install, and batts are manufactured to fit the standard spaces between studs. Fiberglass is resistant to both fire and mold and small amounts of moisture have little effect on its R-value. The characteristics of fiberglass that make it popular can also be drawbacks. Batts or insulation designed for normal-sized cavities do not readily fit into irregular spaces. That can result in uninsulated spaces if installation isn’t done carefully. Air movement around the insulation can significantly reduce its R-value. Mineral-fiber insulation includes slag wool, which is made from melted industrial or steel mill slag that is spun into fibers. The fibers, treated with oil and binders to suppress dust and maintain the material’s shape, can be woven into batts. A second type of mineral-fiber insulation called rock wool is manufactured in a similar way using natural basalt rock instead of slag. Mineral-fiber insulation looks, feels, and performs much like fiberglass. It, too, is sold as batts, loose-fill and rigid boards, and has the same benefits and drawbacks as fiberglass insulation. Since it doesn’t melt or support combustion, it is a good material to insulating around chimneys. Cellulose thermal insulation is made from finely shredded newsprint that is chemically treated to resist fire, corrosion, vermin and fungal growth. It contains at least 70 percent post-consumer paper waste. Only available in loose-fill form, it is either poured in place or installed with a blower. Because of the small size of the particles, cellulose can ‘flow’ around obstructions such as nails, electrical wires, trusses and braces to fill cavities uniformly. One drawback of insulating with cellulose is that it can settle over time if the insulation is not blown or poured to manufacturer’s recommended density. Vermiculite is a mineral closely related to mica. When heated, it expands to form a lightweight material with insulating properties. Two types of vermiculite are used as insulation: untreated and treated. Untreated vermiculite readily absorbs water and dries very slowly. The treated material is coated with asphalt to make it water-repellent for use in high moisture areas. Both types of vermiculite are usually installed by hand, a simple process. It is non-combustible, odorless and non-irritating. It doesn’t offer as high an R-value as other types of insulation, however. Rigid foam insulation is applied directly to framing as rigid sheets. Several types of foam are available, some with post consumer recycled content made from reclaimed fast-food containers and cups. Rigid foam is the insulation of choice where space is very limited but a high R-value is needed. It can be installed on the interior or exterior of a wall, but on the inside it must be covered by a fire-resistant material like wallboard. When the joints between panels are properly sealed, rigid foam insulation can act as both an air and vapor barrier. “Expanded” types of rigid foam insulation are CFC-free; they are now manufactured with a non-chlorofluorocarbon (CFC) gas. “Extruded” types, which offer higher performance, originally were made with CFCs before manufacturers switched to using hydrochlorofluorocarbons (HCFCs), substances with far less potential to deplete the Earth’s fragile ozone layer. While new extruded products that don’t even contain HCFCs will soon become available, they contain chemicals that are still being evaluated to see what their effect will be on global warming. One drawback to most foam insulation is that it deteriorates unless it is protected from prolonged exposure to sunlight and water. It also tends to be more expensive than most other types of insulation. Urethane foams are also high-performance insulating materials available as rigid boards as or sprayed-in-place systems. Once made with CFCs, they are now made with more environmentally benign HCFCs. Floors, walls, ceilings, and doors and windows all combine to make up the “energy envelope” of your home. Caulking seals the small cracks and holes in the envelope; weather stripping seals around doors and windows to help make your home airtight. Weather stripping and caulking is probably the least expensive, simplest, most effective way to cut down on wasted energy in the winter and summer. Improperly sealed homes can squander 10-15% of the homeowner’s heating dollars and reduce the effectiveness of air-conditioning in the summer. While some new doors now come with factory-applied weather stripping, such designs are a recent innovation. Millions of doors across the country have little or no weather stripping. Since most doors have a space – sometimes as much as a quarter inch or more – between the bottom of the door and the floor, large amounts of air can flow in and out of the house. For a typical 36-inch entry door, a quarter-inch small crack can leak as much air as a nine-square-inch hole in the wall. This material, made from rubber, foam or sponge rubber, can be installed in the same manner as V-strip to help seal doors and windows. Hardware stores sell it in various widths and thicknesses, and the tape is self-adhesive and easy to install. Simply cut the tape to the length you need with scissors, peel away the backing from the tape and stick it in place. The size and flexibility of tape make it well suited for blocking irregular-sized cracks. It wears out quickly, however, and needs to be replaced often – probably every one to two years. Felt, either plain or reinforced with a flexible metal strip, is sold in rolls that must be cut to length and stapled or tacked into place. Plain felt should be fitted in a door jamb so that the door presses against it; reinforced felt can be used to seal around both doors and windows. Felt traditionally lasts one to two years before it needs to be replaced. A variation on felt is pile, a carpet-like material that can be glued or tacked in place. It comes in narrow, furry strips. This is the best, most complex, most expensive weather stripping. Think of two V-strips that are placed on the door and the door frame. When the door closes, the two pieces interlock to make a tight seal. Interlocking pieces are placed completely around the perimeter of the door – on the top, both sides and the bottom. Installing interlocking weather stripping can be tricky, since both the door and the frame must be notched with a router. That’s why this type of installation is usually done by professionals. Small tubes of sponge rubber or vinyl can also be used to weather strip around doors and windows. When the door presses against the gasket, it forms a tight seal. By pressing against these gaskets, the door forms a seal. The tubes come with a flange that can be tacked or stapled to hold them in place. Usually they last five years or more. The floor underneath a closed exterior door usually has a raised seal called a threshold. Many thresholds have weather stripping built in. One style includes a tubular gasket seal built into the threshold that presses against the bottom of the door to keep out drafts. Other threshold weather stripping is mounted on the door itself. One style called a door sweep features a flexible flap that seals against the threshold. A long strip folded back on itself along its length, this type of weather stripping can be made of either metal or vinyl. It forms a springy strip that bridges the gap between a door and the door jam – or a window sash and the window frame – to prevent the movement of air. Durable, long-lasting and easy to install, V-strips come with a pressure sensitive adhesive; once you have cut a strip to the proper length, you can stick it in place on the frame without the use of tools. There’s a final place in your home we need to mention when it comes to weather stripping – electric wall sockets and switches. Although they aren’t in the same category as doors and windows, the holes in our walls for electrical outlets and switches do allow cold air into a house in the wintertime and leak cool, air-conditioning air in the summer. It’s a good idea to purchase simple-to-install, pre-cut foam gaskets that fit behind the switch or plug plate to effectively reduce leaks. Insulation is another important component in sealing your home’s envelope. Drafty windows create a large hole in your home’s energy or thermal envelope. In some cases, weather stripping your windows will go a long way towards solving the problem. If you live in a cold climate but don’t have double-glazed windows, you can install temporary storm windows to either the inside or outside of your regular windows to minimize heat loss in winter. If your windows leak really badly, however, you might consider replacing them with new, modern, energy efficient ones. Window replacement can be expensive – $500 or more per window is a rough ballpark estimate – so it will take you five to ten years or more to recoup your investment from the energy savings alone. Of course, there are other benefits to replacing windows – increased comfort and a more attractive home, for example. An improperly hung door, or one with gaps between the door jam and the door itself can let in lots of cold winter air, or allow cool air conditioned air to leak out in summer. It’s estimated that up to 11% of the air leaks in a building are around the doors. In most cases, weather stripping around your doors will fix most of the problems. The outside of a house can strongly influence its energy bills. For example, with careful landscaping, you can improve your privacy, raise the value of your property, add to your home’s comfort, and – this may surprise you – cut your energy bills. Planting the correct trees, shrubs, vines and groundcover can make your home both warmer in the winter and cooler in the summer. In fact, the right type of tree can reduce your summer cooling costs by 20-40%! Landscaping is just one of the ways to improve energy efficiency. Shades and awnings can help cut energy costs. Lighting is also important – an outside light, either on a porch or a post, is one of the five most-used lights in a home. When thinking energy, don’t overlook the value of landscaping. Landscaping can beautify your home. But by planting carefully and thoughtfully, you can improve your privacy, raise the value of your property, add to your home’s comfort and – this may surprise you – cut your energy bills. Planting the correct trees, shrubs, vines and groundcover can make your home both warmer in the winter and cooler in the summer. In fact, according to figures from the California Energy Commission, the right type of tree can reduce your summer cooling costs by 20-40%! Anyone who has ever stood in the sun on a hot day will appreciate the value of shade. But in the heat of summer, plants can keep your home cool in other ways besides offering shade: they create a cool microclimate that can dramatically reduce the temperature in the surrounding area by as much as nine degrees. That’s because during photosynthesis, large amounts of water vapor escape through their leaves, cooling the passing air. The generally dark, coarse leaves also absorb solar radiation. Deciduous trees – trees that drop their leaves each winter – offer one of the best ways to cut home cooling costs. If you plant them on the northeast-to-southeast and northwest-to-southwest sides of your house, they can provide excellent protection from the summer sun by shading roof, walls and windows. They also help to warm the house in cold weather. Because they lose their leaves in autumn, deciduous trees permit winter sunlight to reach the house, helping to heat it with solar energy. This benefit is why experts suggest that, if you live in a moderate or cool climate, you don’t plant deciduous trees directly to the south of your house. In the winter, even the bare branches of mature deciduous trees can reduce the amount of sun reaching your home. When you’re picking out a shade tree to plant, consider its height, growth rate, branch spread and shape. Those factors will influence the cooling benefits the tree offers. For western exposures, wide-spreading trees are best. And don’t forget to consider the height of the tree – ones that never grow tall won’t provide much shade. In general, try to shade as much of the roof and walls of your home as possible. If you need to choose between covering a small portion with dense shade, or a larger area with less dense shade, go for the larger area. That strategy will produce the best cooling results in summer. It’s also a good idea to plant trees so they shade the windows that allow summertime heat to enter your house. If you’re concerned about preserving your view, keep the sun’s path in mind and plant one or two smaller trees slightly to the side of the window. Consider the prevailing wind and air currents, as well, when you’re planting, Evergreen trees that don’t drop their leaves can offer valuable protection from the winter winds that chill your home. If you plant them where they can block a cold wind before it hits the outside of your house, they will help to cut your heating bills. In addition to trees, vines and climbing plants also act as effective sunscreens. They are particularly good against south-facing walls where you probably don’t want shade trees. Planting a deciduous vine such as grape lets you enjoy the benefits of both summer shade and winter sun. Keep air circulation in mind when you’re planting vines. By setting trellises away from the wall, you allow air to circulate. Placing vegetation too close to your house can trap summer heat and make the air around your house even warmer. Leaving space behind trellises also helps to prevent vines from attaching themselves to your home’s exterior and damaging it. Just as evergreens can stop winter winds, carefully placed trees and shrubs will direct cooling summer breezes to your home. Bushes planted a few feet away from the house will provide extra shade without obstructing cool air currents. Shrubbery will also reduce soil and wall temperatures and help to protect your home’s foundation from root damage. Don’t overlook the benefits of planting low ground cover such as grass, small plants and bushes. A lawn is usually 10 degrees cooler than bare ground in the summer. Large paved areas and gravel beds will store heat, especially if they’re dark in color. In addition to causing substantial temperature increases, they reflect glare. You can reduce this problem by surrounding areas like your patio or driveway with shrubs and grass. Better yet, consider drought-resistant ground covers that use less water. Most turf grasses used in normal lawns require significant amounts of water, maintenance, and chemicals. By planting perennials, shrubs and native plants in the majority of your lawn, you can eliminate the expenses associated with high water usage while still enjoying the cooling benefits that plants bring. Plants that historically grow in your area are an excellent choice for landscaping. They are easy to maintain and also have minimal water needs. Native plants are especially well suited for areas with low rainfall or seasonal droughts. Your local nursery can tell you which plants are native to your region. If you choose your plants carefully, you can minimize water use even as you maximize your yard’s beauty. When deciding on flowers, pick perennials over annuals, because perennials tend to have significantly lower water requirements. By picking a variety of perennials you can stagger bloom cycles, ensuring that you always have a variety of colors. Although perennials do require some maintenance such as pruning, this is minimal when compared to the labor involved with annuals. Xeriscaping comes from the Greek word xeros, meaning dry. This type of landscaping is perfectly suited to dry climates where minimal water use is required. Contrary to popular opinion, xeriscaping does not mean cacti and sand. Trees, shrubs, ground covers, as well as outdoor pools and fountains, are all elements of xeriscaping. Xeriscaping is an excellent option for those with too little time in the day. Because it’s very low maintenance, it reduces pruning and other maintenance responsibilities, freeing your schedule up for other activities. Just like any of the landscaping we’ve discussed, xeriscaping can reduce a home’s energy costs by shading your home. Bushes and shrubs planted 10’ or more from your house can reduce heat and glare, while trellises along your home’s walls can prevent the sun from entering your home. Live oaks and other tr4ees with block the sun while allowing breezes to circulate. At the same time, by installing a fountain or pond, you can help to reduce the dryness in the air. The optimal placement for fountains or ponds is upwind from your house, which allows cool breezes to enter your home. For best results, talk to knowledgeable salespeople at your local nursery or garden center. They can direct you to native plants that survive in your area with minimal care and that require little water. They’ll be able to point out aspects of a tree or shrub that may not be immediately apparent, such as how tall and far-reaching it will grow. Whatever plants you choose, make sure they can withstand local weather extremes. Landscaping isn’t an alternative to weatherizing your home, but it is an effective, additional way to help lower your heating and cooling costs. That’s why many utility companies offer landscaping rebates or support local tree-planting programs. Check with yours – maybe you qualify for such a program. Anyone sitting under a tree on a hot summer afternoon knows the cooling benefits of shade, but they may not realize just how effective it can be as a low-tech, low-cost way to cut their summer cooling bills. Shading your home – with trees and other vegetation, or with exterior and interior shades – can reduce the temperature indoors by as much as 20 degrees on a hot day! About 40% of the unwanted heat that builds up in your house comes in through windows. Although both exterior and interior shades can control this heat gain, exterior shades – items such as awnings, louvers, shutters, rolling shutters and solar screens – are far more effective, since they block sunlight before it enters the windows. Awnings rate high as shading devices because they block direct sunlight. Usually made of fabric or metal, they are attached above the window and extend outward and down. A properly installed awning can reduce heat gain in your home up to 65% on southern windows and as much as 77% on eastern and western windows. A light colored awning does double duty by also reflecting sunlight. Maintaining a gap between the top of the awning and the side of your house helps to vent any accumulated heat from under a solid surface awning. If you live in a climate with cold winters, you well want to remove awnings for winter storage or buy retractable ones to take advantage of the desirable winter heat gain. Aesthetically, an awning mounted at an angle of 45 degrees is pleasing to the eye. Make sure the awning does not project into the path of foot traffic unless it is at least 6’8” from the ground. The amount of drop you need – how far down the window the awning should come – depends on where the window is located. On the east or west side of the house, the awning needs a drop that covers 65-75% of the window. Because of the higher angle of the sun, an awning on the south side needs to cover only 45-60% of the window to produce the same amount of shade. In either case, awnings can block much of the view from a window. Slatted awnings allow limited viewing to help overcome this disadvantage. Louvers are an attractive option because their adjustable slats control the level of light entering a home. They operate like exterior mini-blinds and, depending on the design, can be adjusted from either inside or outside of the house. Slats can be vertical or horizontal. Non-removable, fixed louvers can also be attached to the exteriors of window frames. Rolling Shutters have a series of horizontal slats that run down along a track. Rolling shades are similar in design but use fabric. Although both options are expensive, they work well and many models can be conveniently controlled from the inside. One disadvantage is that they block all light when fully unrolled. Solar screens resemble standard window screens, except they block light and cut glare without obstructing the view or eliminating air flow. They also provide privacy by restricting the view into your house. Solar screens come in a variety of colors and screening materials, and some local utility companies sponsor shade screen programs. Do-it-yourself kits are available, but such screens typically do not last as long as professionally built screens. To shade your home from the inside, you can use draperies and curtains made of tightly woven, light-colored, opaque fabrics that reflect much of the sun’s rays. The tighter the curtain is fitted against the wall around the window, the better it will prevent heat gain or loss. Two layers of draperies improve the effectiveness of the draperies’ insulation when it is either hot or cold outside. Although venetian blinds are not as effective as draperies, they can be adjusted to let in some light and air while reflecting the sun’s heat. Some newer blinds are coated with reflective finishes. To be effective, these reflective surfaces must face the outdoors. Some window manufacturers even offer “mini-blind” louvers built-in between the glass of dual-pane windows and skylights. Some interior cellular, or honeycombed, shades also come with reflective Mylar coatings. One drawback of the design is that it blocks natural light and restricts normal air flow. Likewise, opaque roller shades can be effective when fully drawn but also cut off light and air.